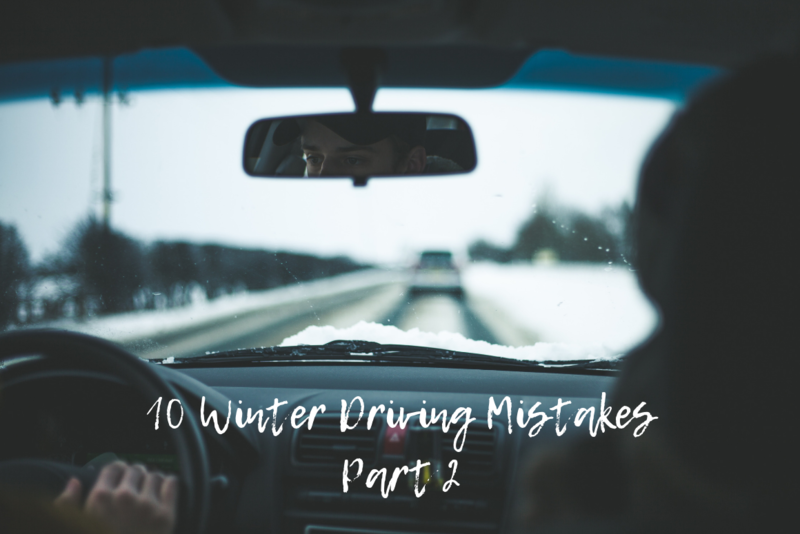 Welcome to Part 2 of our Winter Driving Mistakes – here are five more common mistakes that drivers make during the colder winter months. Much of the experience of driving comes from what you can feel while you’re behind the wheel. If you’re all bundled up in your thick winter jacket, with mittens and heavy boots, you’re less likely to be able to feel what’s going on with your car while you’re driving in snow, ice, or rain. Consider having a pair of shoes and a lighter jacket to slip into once you’re in your car, so you can ensure you have complete visibility, and responsiveness to your vehicle. If a blizzard hits unexpectedly, or you’re trying to beat a snowstorm to your destination, there may be times when you can’t drive anymore simply because the conditions don’t allow it (black ice, snow on the road, no visibility). Leaving the car to look for help is dangerous is never a good idea – you leave the shelter of your vehicle for the unpredictability of the elements, you’re much less visible walking along the road, and walking even a short distance in winter weather takes longer and exposes you to more danger than staying in the car. Your car emergency kit should have enough supplies to keep you safe in your vehicle for up to 72-hours. Driving in the snow and ice gets a little less scary with experience, but if you’re new to it, start by putting yourself in the right mindset, and keeping calm while you’re behind the wheel. Stress leads to overreactions, causing you to tense up and jerk the steering wheel or brake prematurely, all of which can lead to loss of control and accidents on the road. If you’re nervous, educate yourself on winter driving so you can make safe choices, and if you’re really unconfident, consider asking someone else to drive or staying home until the weather passes. Here is a great resource to learn how to get out of various types of skids [Transport Canada]. Do you rely on running lights? Do your headlights come on automatically? Running lights aren’t bright enough to see in low visibility situations, and automatic headlights might not come on in bad weather that happens around your lunch hour. Not having your headlights on, means that your tail lights aren’t on either, and you become almost impossible to see in heavy fog, rain, or snow. Always turn on your complete headlight system, keep your low beams on in cloud or low visibility (high beams reflect back at you and can be blinding), and if you have to, use your four-way flashers to let other cars know you’re slow or stopping unexpectedly. Whether you have winter tires or four wheel drive, continuing to drive at normal speeds when winter weather arrives is a recipe for disaster. Other drivers will be moving a lot slower than normal, the road conditions can be completely unpredictable (black ice is deadly and often hard to see before you hit it), and it takes you longer to brake if you need to. Keep your driving distances in mind and slow down so that you can see as much as possible, and have time to react if and when you need to.